“I’ve opened up my roll of wallpaper and I see in the instructions that they recommend a lining paper, What does this mean?”. In this post we’ll go through what lining paper is, what it does and when it should be used. Basically, lining paper makes wallpaper more sound and durable, similar to how a primer can prepare a surface for painting. What is the purpose of lining paper? Wallpaper liner, or lining paper is a blank paper which is installed before wallpaper, as a way to reinforce the wallpaper going over the top. In walls where there are cracks or surface irregularities the liner can smooth these out and make them less noticeable. When the lining paper is hung horizontally and the wallpaper hung vertically, the wallpaper can withstand both vertical and horizontal movements in the wall. When should a liner be used? Much like our primer example, sometimes lining paper is necessary and sometimes it’s an unnecessary step. The first place to look is in the installation instructions; a wallpaper manufacturer will generally say in the installation instructions whether or not a liner is recommended. Thinner papers sometimes require a liner, because they are less effective at hiding surface irregularities than a thicker paper. In other words, any little bump on the surface underneath shows through the paper as a bump. Metallic papers sometimes require a liner for the same reasons. Any little bumps show through the glossiness of the paper, whereas a matte paper would hide those imperfections better. Can I still use a liner even if the manufacturer has not explicitly recommended one? Of course, we can install a liner under most wallpapers no problem! There’s no downside to installing lining paper, except for the extra cost. If your walls have a lot of cracks, which is typical of some older Toronto homes. We see this usually in old plaster walls where there is some movement in the plaster. These cracks will generally come back if a lining paper is not used. As we discussed, a lining paper can flex with movement in the walls and keep that movement from damaging the wallpaper above. 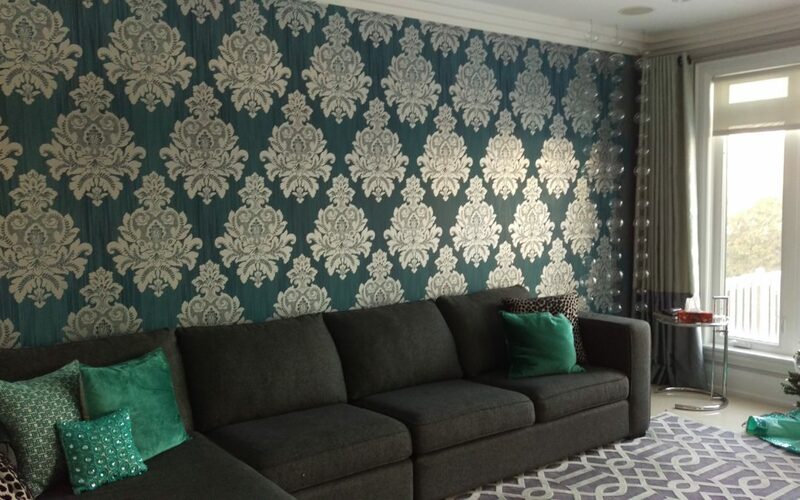 If you want a wallpaper installer that will ensure that your paper is properly installed according to the manufacturer’s directions, why don’t you book a quote? We’d be happy to Transform Your Home With Lasting Beauty!